A couple of exhibits on right now in NYC featuring environmental themes have caught my attention. The art shows run the gamut from recycled objects to artistic commentary on natural vs unnatural in modern life. Hopefully you'll get a chance to catch one of these while they're around. "Second Lives: Remixing the Ordinary" is the inaugural exhibition at the Museum of Arts and Design in the new building at 2 Columbus Circle, which opened in September 2008. The exhibition features work by 50 international established and emerging artists from all five continents who create objects and installations comprised of ordinary and everyday manufactured articles, most originally made for another functional purpose. For a complete artist list, click here. The exhibition includes works by well known designers, Ingo Maurer, Tejo Remy, and the Campana Brothers as well as internationally acclaimed artists, such as Tara Donovan, Xu Bing, El Anatsui, and Do Ho Suh. Highlights from the show include American artist Tara Donovan's "Bluffs," a group stalagmite-shaped structures made of clear plastic buttons delicately placed one on top of the other. 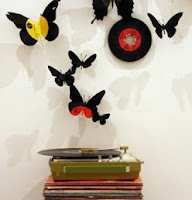 Paul Villinski, an American, creates beautiful butterflies out of his old record collection, producing a "soundtrack" of his life (image, right). Other featured works are made from buttons, spools of thread, artificial hair, used high-heeled shoes, plastic spoons and forks, shopping bags, and 25-cent coins to mention only a few. The exhibition surveys the rich artistic landscape of much contemporary art, in which hierarchies among art, craft, and design are disregarded. In addition, the exhibition examines the ways in which artists transform our world, respond to contemporary cultural paradigms, and comment on global consumerism. In the exhibition, each artist utilizes the gallery space as a platform to consider the unnatural. As we move farther and farther away from a simple relationship with nature, a relationship naturally evolved out of a need for survival, our abilities to control and manipulate our environment and ourselves have taken us places beyond our imagination. What IS unnatural in this era of artificially modified humans/plants/materials; medicines for mood or muscle enhancement, hormone manipulation of gender and fertility? The quest for eternal life, a cure for diseases or poverty, a desire for pleasure and profit, a need for a spot in the hierarchy of wealth and well-being, or shear perversity, all motivate this drive to use and/or abuse nature. The following artists invited to create work for this exhibition expose, distort, and subvert some of the premises of the natural to create commentary on - the unnatural. Chris Twomey, Elizabeth Riley, Liz-N-Val, Kim Holleman, Alyssa Fanning, Peggy Cyphers, Joel Simpson, Miwa Koizumi, Kathleen Vance, Gulsen Calik, pale Infinity & Flash Light.